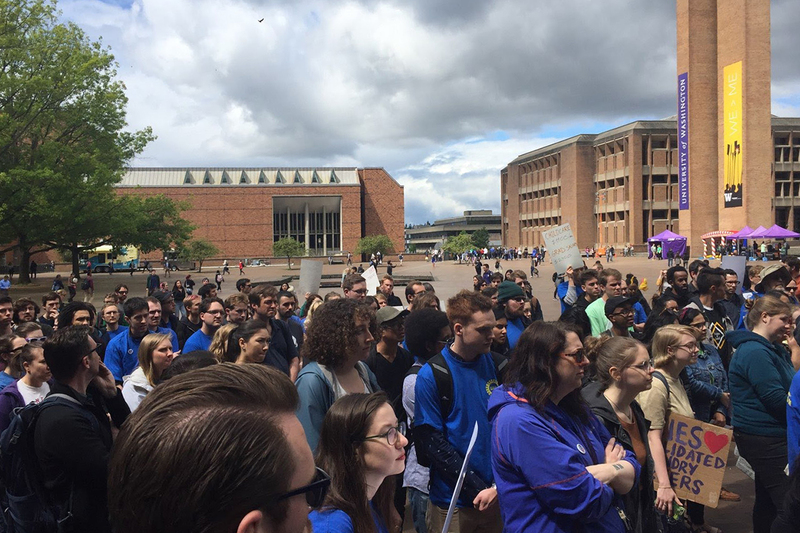 Following an intense contract battle – including the largest strike action in University of Washington history – the Academic Student Employees (ASEs) of UAW Local 4121 ratified a new contract on June 3. Because of bold action and the willingness to fight, ASEs won some significant gains, including affordable mental health coverage, trans-inclusive health care, and union-administered sexual harassment prevention trainings. Throughout the bargaining process, the UW administration threw up numerous delays, regularly belittled the workers, and openly flouted labor law. The administration claimed repeatedly that it didn’t have money to give ASEs a fair contract, but refused repeated requests by the union to open the books and have an honest and transparent conversation about the budget. They also forced negotiations to be in the place and time of their choosing – a massive inconvenience to the workers – which backfired on several occasions when hundreds of ASEs came out to participate in the bargaining sessions. At one point management used the police to force union members from the building! At the contract’s expiration on April 30, the membership voted 2,272 to 196 to reject the management’s last offer and to move ahead with a one-day strike. The strike, which happened May 15, was the local’s first since 2001, and the first labor action for the vast majority of members. Infuriated by the UW’s refusal to grant serious wage increases and their proposal to increase costs on ASEs by hundreds of dollars per year, more than 2,500 ASEs poured onto the picket lines and rallied in Red Square in an action that shook the campus. Socialist Alternative was there and previously reported on the strike. While many ASEs hoped that a one-day strike would be enough to pressure the University to accept their crucial demand for fair annual wage increases and a full waiver of student fees, it was clear during the next bargaining session that UW had no intention of seriously addressing workers’ concerns. Many of the most engaged and radical ASEs had been actively preparing for a two-week strike since the 15th, but the University administration had been busy working to pressure the student workers not to strike and intimidating international student workers. The bargaining committee voted to recommend ratifying UW’s latest deal, and while there was significant dissent among the rank-and-file (918 members voted no), a majority voted to ratify the contract. The final contract was a limited victory. On one hand, it concretized some significant gains including nearly fully funded mental healthcare, trans-inclusive health care, protections against discrimination and harassment, and a freeze on fees. On the other hand, it did not contain a full fee waiver, and contained only a 2% annual pay increase, less than inflation in Seattle. Even though a second planned strike did not happen, the gains that were won were a direct result of ASEs fighting approach and successful actions to challenge the UW administration. This struggle serves as another example of the stirring labor movement in the U.S., exemplified by the historic teachers’ strike waves across the South which brought hundreds of thousands of teachers into bold struggle for pay increases and to defend public education. Socialist Alternative members, including Councilmember Kshama Sawant, joined ASEs at the picket lines, attended rallies, and our members within the union helped organize tactical meetings. Sawant also spoke at multiple rallies, drafted a letter to UW President Ana Marie Cauce urging the UW administration to bargain fairly, and submitted a resolution, which passed, to the Seattle City Council to vote in support of UAW 4121’s position. UAW 4121 now has a new layer of rank-and-file ASEs who are active and learning the lessons from this struggle. ASEs in UAW 4121 are the first in a long line of unionized workers on campus about to bargain on new contracts. The newly unionized doctoral workers, maintenance workers, truck drivers, and other staff stood united with ASEs throughout bargaining and recognized that a strong contract for UAW 4121 could set a precedent. ASEs should commit now to showing that same level of solidarity in all of these contract fights. We should have a sober assessment of the strengths and weaknesses of a given struggle. Workers won an important victory, but can also learn lessons from this strike to take into future struggles. To win more they would have needed greater preparation for their contract battle and a more prolonged strike in the final weeks of Spring Quarter and potentially the opening weeks of Fall. We should also recognize there are important characteristics of the student workforce which create challenges for organizing. ASEs are a highly transient workforce, some of whom may graduate shortly after their appointment; and of course, the Janus ruling threatens UAW 4121’s financial position and is a historic setback to the ability of public sector workers to collectively organize. Carrying out a sustained strike to win major gains is always challenging, and requires months of political and organizational preparation activating wider and wider sections of the membership, and raising of consciousness and confidence, among the rank and file, a critical reason why the West Virginia strike was successful. Such preparation would have increased the ability of UAW in carrying out a second and longer strike, especially in putting serious pressure on UW with a strike ongoing during exam and grading weeks. In the upcoming months, ASEs can begin laying the groundwork, which would include organizing regular rank-and-file political discussions, and building stronger links and solidarity with non-ASE undergraduates, faculty, and other campus unions. All of this makes it all the more urgent ASEs absorb the lessons from this struggle now and organize to making their future struggles stronger. UW has been put on notice, but student workers have a whole lot more to win. Previous articleActivists Successfully Block Downtown Seattle ICE Office in Peaceful Civil Disobedience!